When the American Civil War began in 1861, citizens of both the North and South had no idea how long the conflict would last. Many Northerners, including the Union army leaders, envisioned a three-month war that would quickly bring the South back into the Union. The assumption that it would be a short war, coupled with a surge in patriotism, led thousands of New Yorkers to voluntarily join the army. The men of the Penny family were no exception. In 1860, the Penny family consisted of seven members: Elijah, Jane, Archibald, Alfred, Eugene, Charles, and Louise. They lived in the town of Southeast in Putnam County, New York. Elijah, the father, and the two older boys, Archibald and Alfred all volunteered to fight for the Union in 1861. The letters, census records, and military documents all provide a glimpse into one New York family's experience during this time of national unrest. What impact did the Civil War have on individual citizens, families, and local communities? How was Archibald Penny personally affected by the Civil War? 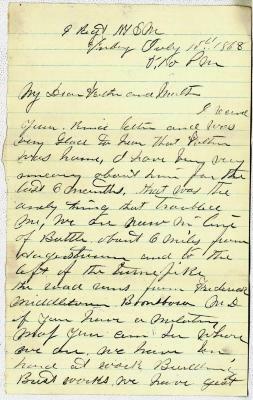 Letter from Archibald to his mother expressing relief that his father his home. Who is Archibald concerned about in this letter? PS I have not heard from James Crain since we left Gittesburg. He belongs to the [ ] and I think 8 Brigade.